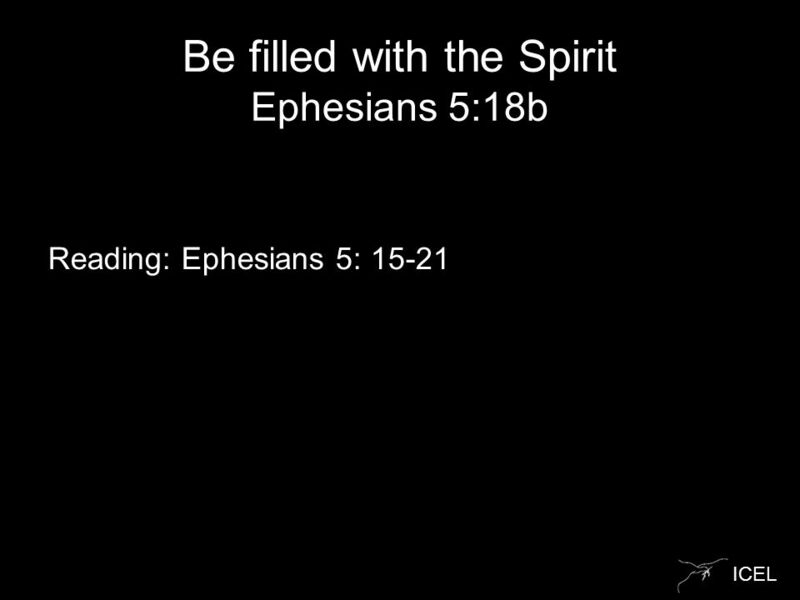 ICEL Be filled with the Spirit Ephesians 5:18b Reading: Ephesians 5: 15-21. 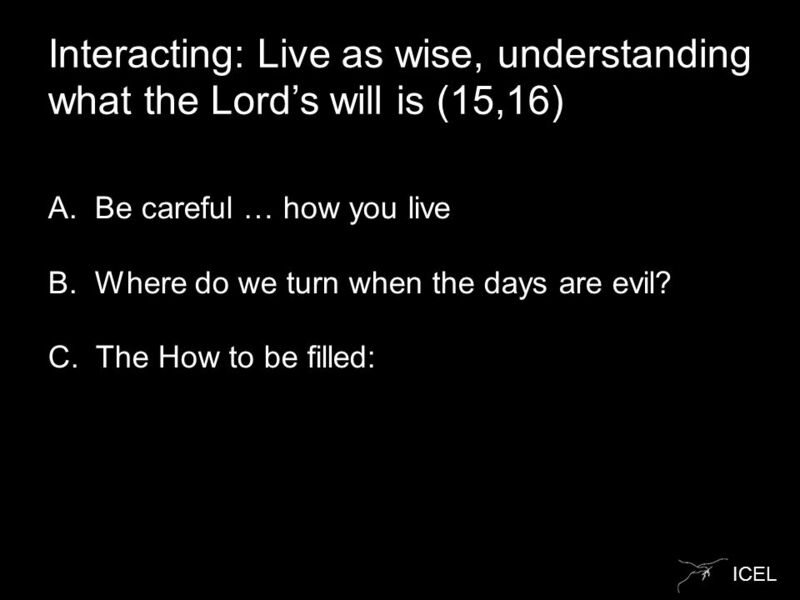 2 ICEL Ephesians 5: 15-21 15 Be very careful, then, how you live – not as unwise but as wise, 16 making the most of every opportunity, because the days are evil. 17 Therefore do not be foolish, but understand what the Lord’s will is. 18 Do not get drunk on wine, which leads to debauchery. Instead, be filled with the Spirit, 19 speaking to one another with psalms, hymns, and songs from the Spirit. 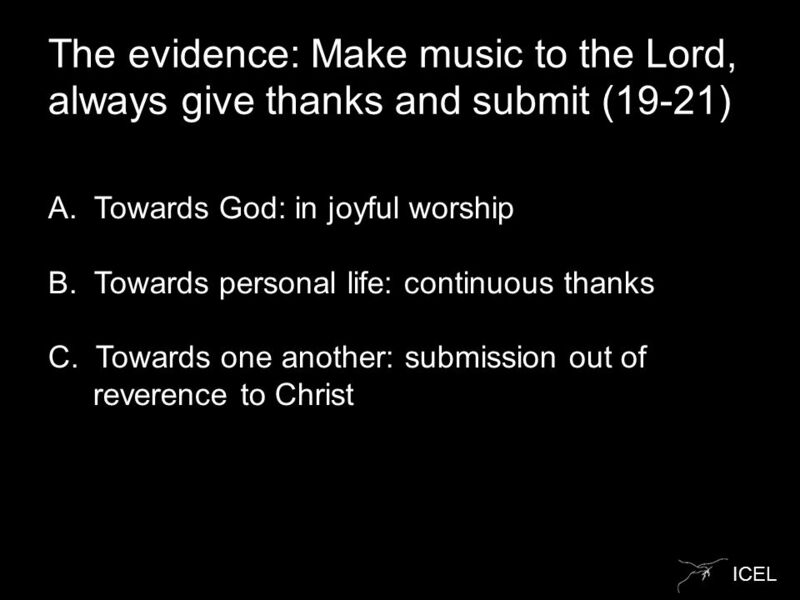 Sing and make music from your heart to the Lord, 20 always giving thanks to God the Father for everything, in the name of our Lord Jesus Christ. 21 Submit to one another out of reverence for Christ. 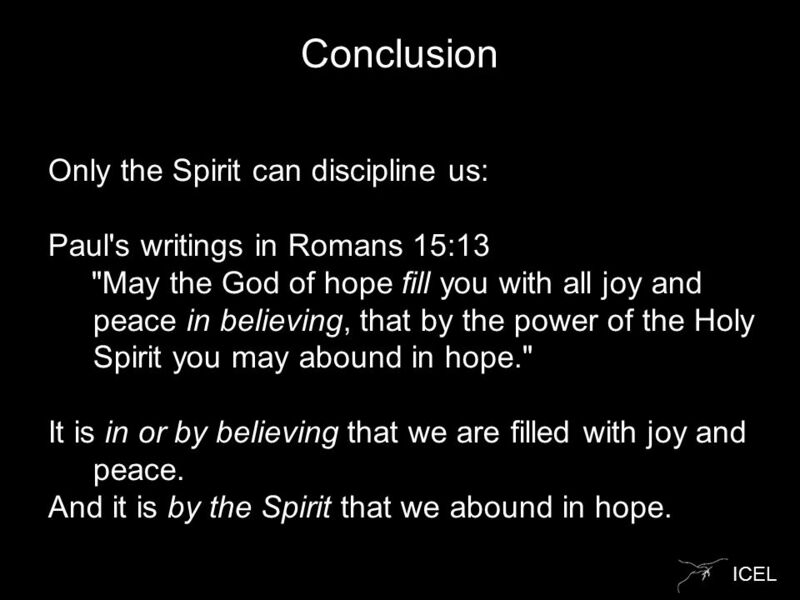 7 ICEL Conclusion Only the Spirit can discipline us: Paul's writings in Romans 15:13 "May the God of hope fill you with all joy and peace in believing, that by the power of the Holy Spirit you may abound in hope." It is in or by believing that we are filled with joy and peace. And it is by the Spirit that we abound in hope. 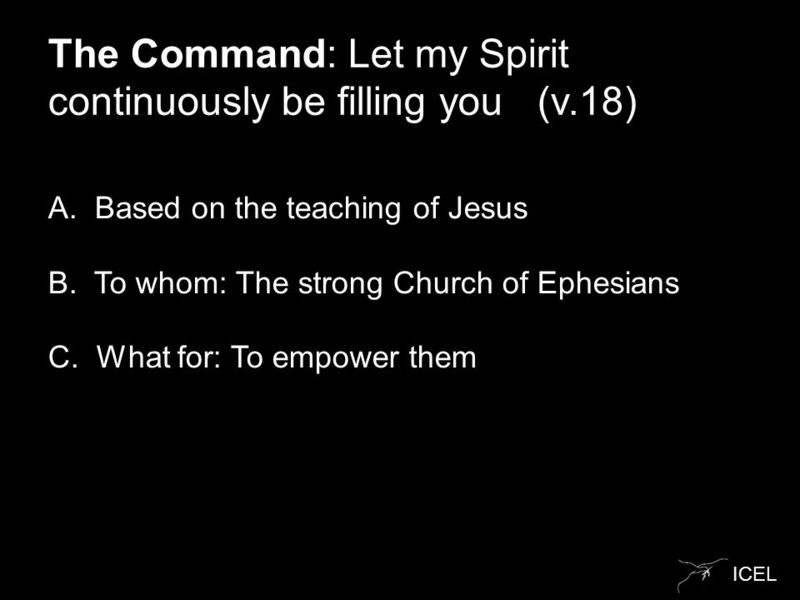 Download ppt "ICEL Be filled with the Spirit Ephesians 5:18b Reading: Ephesians 5: 15-21." As Dearly Loved Children... Ephesians Series - Chapter 5. Introduction to Ecclesiastes Ecclesiastes = The speaker or preacher Author – Solomon, son of David Date – Est. 935 B.C., near the end of Solomons reign. Jason deGraf Denis peterson – paint Samuel Silva, (redhead girl) an artist from Portugal, creates these incredibly realistic images with nothing but a.
Ephesians 5:1-20 Message 1 in our 5-part series on Ephesians 5 & 6. “Through Him then, let us continually offer up a sacrifice of praise to God, that is, the fruit of lips that give thanks to His name. And do not neglect. 8 For you were once darkness, but now you are light in the Lord. Live as children of light 9 (for the fruit of the light consists in all goodness, righteousness. 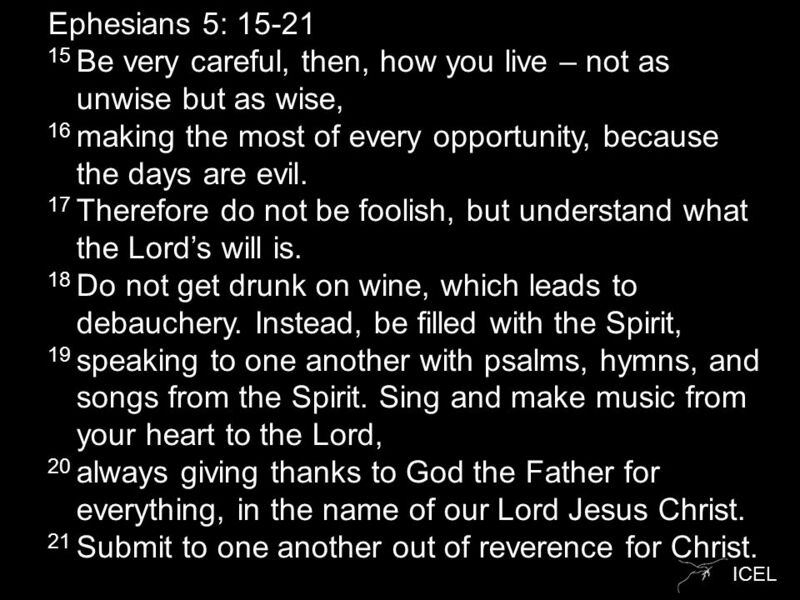 Living Belief Ephesians 5:15-22 Walking in Wisdom. Walking a Wise Walk Ephesians 5: RECAP: Ephesians chapter 5 so far... 1 Be imitators of God, therefore, as dearly loved children 2 and live a life. First Things First: finding the balance. “Live life with a due sense of responsibility not as those who do not know the meaning of life but as those who. 7. Walk as Children of Light Ephesians 5 Robert C. Newman Abstracts of Powerpoint Talks - newmanlib.ibri.org -newmanlib.ibri.org.  What energizes you?.   (Luke 24:49) I am going to send you what my Father has promised; but stay in the city until you have been clothed with power. 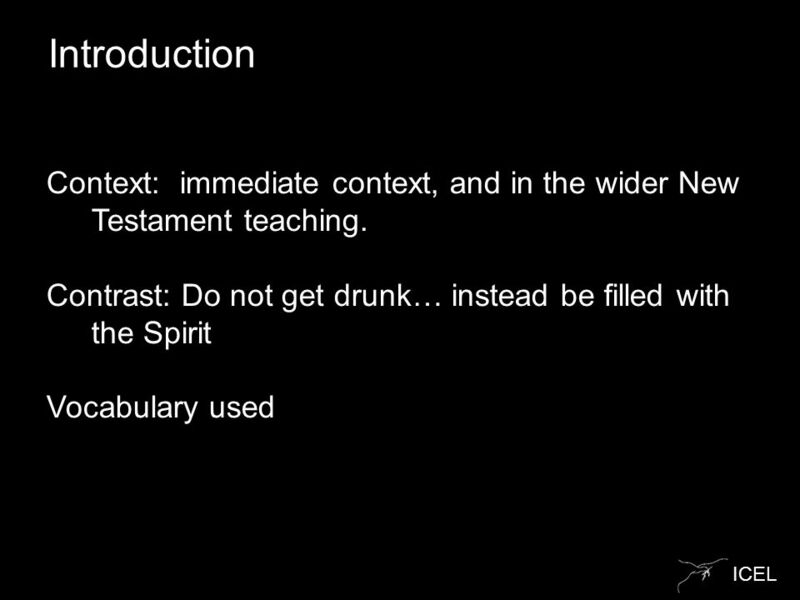 Ephesians 5:21-33 (ESV) 18 And do not get drunk with wine, for that is debauchery, but be filled with the Spirit, 19 addressing one another in psalms.